Sometimes I like to imagine the different apple varieties next to each other in friendly competition. If so, then this Braeburn tree would be an over-achiever. Perhaps it knows I am considering replacing it if it does not improve on how it did last year (either rotted on the tree or was bland). It doesn’t matter how many blossoms it sets on this branch tip, as the tip can only support a couple apples and I will pick the rest off. Commercial nurseries will use a thinning spray for this, but I have to do it manually. I’d hate to have to do it on a large tree, as it is enough trouble thinning my Belgian Fence trees where I can get right up to them. Some times we’re so worried about pollination, but I’d be just as happy if only a few flowers on this branch tip got pollinated, as it would make less work. There’s a lesson in here somewhere, I just haven’t figured it out yet. Here in the lowlands the sleepy-head trees slowly wake out of their slumber, opening the blossoms a few at a time at a leisurely pace. It may take them months to completely blossom, but they get around to it eventually. But up in the mountains, the trees explode with blossoms, putting on a show of pinkish-white cotton candy and bright green leaves. It is worth the drive up to Oak Glen or Crestline to see them. The Granny Smith have already opened up but the Rome Beauties and Winesaps should be going by now. For Oak Glen, I recommend the Wildlands Conservancy’s Oak Knoll Park at Los Rios Rancho. Take a walk down their nature trails past the orchard to the pond, and you’ll see the first photo above. If you’re up there on a Saturday, head over to Riley’s Farm for lunch at the Hawk’s Head Tavern and order the chicken pot pie with the caramel-coated apple dumpling for dessert (keep in mind they’re closed Sundays). In Crestline, drive down Dart Canyon Road from the lake; the trees are about 1/4 mile in (second photo above). Stop on your way out at the crest at the Loose Caboose Cafe and have their sweet potato fries. While you’re waiting for your food check out the On The Mountain magazine in the newsracks and read my article on Red Delicious. The blossoms above are at the magical stage known in the industry as “Pink”. This is a stage in the fruit development that in commercial orchards starts a massive spraying program, but to us is just a pretty stage of the apple blossom. The few blossoms that have a lot of white in them are almost at the “balloon” stage, the next step right before full blossom. 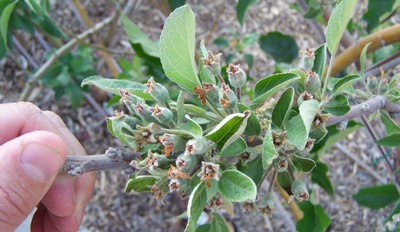 After they reach full blossom the pollen will be viable for about 5-7 days; about 5-7 days after that the blossom ovules will either swell up into little apples or dry up and fall off, depending if they were pollinated or not. In a cold climate the apple tree blossoms all at once and you get a big show. This is because the blossom stage is a vunerable time from frost and the tree tries to get it over in a short of time as possible. But in a warm climate like Southern California the blossom time is much more extended, often stretching over a month or more. This would drive commercial growers nuts as it would make it almost impossible to time their spraying programs. But to the home grower it just means you get apples over a longer period, which is just all right by me. This may be part of how the misconception that apples are not suited for warm climates originated, as most agricultural advice has been directed towards the commercial grower. 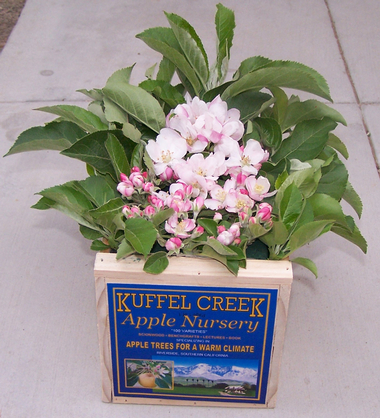 It is part of our mission here at Kuffel Creek Apple Nursery to provide advice for the home gardener, which is sometimes much different than for the commercial grower. There are a few apples that do have a condensed blossom period here such as Dorsett Golden, Anna, Fuji, Braeburn, Terry Winter, Rome Beauty, Gala, and Carolina Red June. These would be considered “low chill”, but that doesn’t mean higher-chill apples won’t do well here also. The Riverside Flower Show & Garden Tours is this weekend, and above is my entry. I was thinking of adding orange blossoms to it also, but they peaked out last weekend. I got the usual questions like “did you bring these down from Oak Glen? (a mountainous apple-growing area nearby). I assured them, no, they’re grown a couple blocks from the parent Washington Navel Orange Tree. Then they asked the variety of blossoms, and I replied “Royal Limbertwig, Thornberry Crab, Lord Lamborne, Rome Beauty, Dixie Red Delight, Fuji, and and Washington Strawberry”. I get a puzzled stare from the nice lady, who only recognized Fuji. They asked if those varieties grow in Riverside, and I tell them all apple varieties will grow in Riverside. They can’t really argue, as they’re holding a box of apple blossoms, and I can tell they will want to know more by the end of the show. And I’ll be happy to tell them. Well, I’m having a bad influence all over the southern half of the USA. This last spring I sent a big bundle of scionwood to Texas and I got a nice email from some folks in the Arizona Chapter of the California Rare Fruit Growers who read this blog (hi guys). Well, it looks like it wasn’t as as hot as I hoped it was, as fire blight has reared its ugly head. I was thinning the Braeburn tree and my fingered touched something sticky; the brown ooze that is a hallmark of fire blight (the amber drops on the shriveled blossom stem in the photo above). It was in its initial first stage, as it probably was contracted through bees infecting the blossom. If I hadn’t had caught this, it would have infected the leaves next, which would shrivel up, turn black, and droop but stay firmly attached, as would the tiny apples. Last year I didn’t know what to look for, and by the time I recognized it fire blight had infected whole branches on the Braeburn and Gala trees, making the leaves turn brown and droop. I was sadly cutting whole branches of fruit off and sterilizing my pruners, and one tree even had it infecting the trunk, requiring major surgery to cut it out. This year it looks like I found it much earlier, and I just removed the one spur. I will keep a watchful eye out to make sure I didn’t miss any and that it hasn’t spread past the spur. I checked the other trees in the orchard, and saw no sign of it there. This demonstrates one of the distinct advantages for growing apples on a trellis; you are able to get right up to them to check for problems. If this infected cluster was way up high on top of a tree somewhere, I would not have found it until the whole branch turned brown and possibly infected other parts of the orchard. Smaller trees are definately the best bet for the home gardener. I found out today that pressure-treated posts (the stuff that is stained green with little slots all over it) are forbidden in Certified Organic farms. 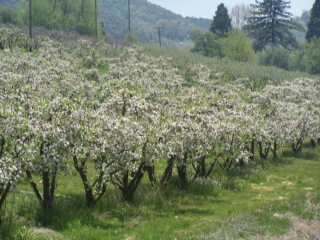 These posts are used in modern apple orchards to support the trellis wire of Tall Spindle systems, a method of planting small trees close together to quadruple yields. The formula for the green stuff used to be CCA (Chromated Copper Arsenate). It is a poison containing copper and arsenic, which are deadly to fungus and termites respectively, two things that damage and decompose wood. It worked good and was in wide use. But because of its wide use, studies were done on if the arsenic leached out into the soil. The research was inconclusive at best, but typical hysteria ensued as attorneys and plantiffs lined up to claim damages. The industry voluntarily eliminated its use after 2003. 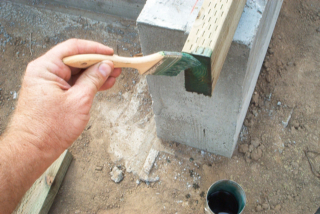 The replacement formula is usually either Amine Copper Quat (ACQ) or Copper Azone (CA). It has twice the copper content of the CCA and thus is more expensive. Another drawback is the electrolysis between the copper in the preservative and steel fasteners and joist hangers causing corrosion. The industry has recommended that all fasteners and framing hardware be either double-dipped galvanized or stainless steel (more expensive again). We won’t know for a few years if the new formula is any better or less of a hazard than the old. There was never any demonstrated danger from the old leaching into the soil, and no one has recommended tearing out your old pressure-treated deck; the trauma involved in the demolition would release far more arsenic than would ever leach out naturally. Natural alternatives like Chestnut and Redwood are no longer viable options, and so treated wood is here with us to stay. I fear that hype and hysteria has replaced a decent product with a more expensive one that has not demonstrated a tangible benifit. It was over 94 degrees today and was really dry and breezy (sorry to the folks back east who are freezing). I used to get upset when it got hot in April, as it is not uncommon to top 100 degrees a few days (two years ago April was over 100 almost every stinkin’ day). But last year was different; all the way up through July we had foggy mornings burning off to hazy afternoons in the mid-80’s, but none of the serious heat we usually have by then. 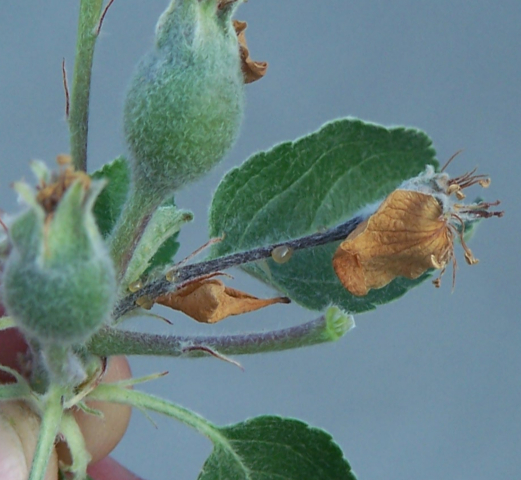 This weather triggered a nasty surprise for us: fire blight. This bacterial disease loves warm, damp weather and had been mostly unknown to us, as it turns out temps above 94 degrees knock it out and so it’s usually dead by the time most of our trees blossom in late April. It causes branch tips to wilt and secrete this amber colored ooze, which is spread by wind and insects to infect other trees. It can work its way down the tree and if it girdles the trunk, the tree dies. There is no cure for it other than to cut out diseased parts. The usual suspects were loaded with it; Gala, Pink Lady, and Braeburn were especially hard hit. I was chasing strikes all over the place, pruning our diseased brances and disinfecting pruners. All the benchgrafts I planted at one elementary school were killed off. A late July heat wave put an end to the carnage, but not until I got a good taste of the misery the rest of the country has to live through trying to grow apples. But now I can better converse with distant growers and emphasize and relate with them (“yeah, I remember the fire blight attack of ’07, shephards crooks everywhere, brown ooze coating every tree”). And now I’m thankful for the early spring heat waves, as it is a cleansing heat that keeps the icky ooze at bay. It’s supposed to cool down next week anyway. 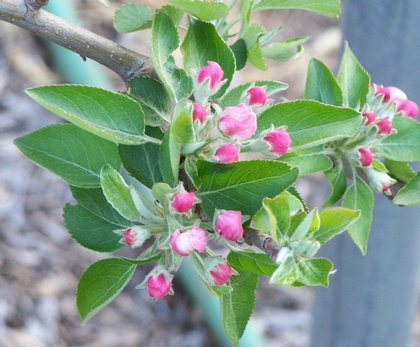 Apples need a certain amount of chilling hours to blossom and fruit; since warm climates do not receive sufficient chilling, only a few “low-chill” apples like Anna and Dorsett Golden will do well there. Yeah, right. I know, you’ve read that in every gardening book and heard it from every university master gardener. 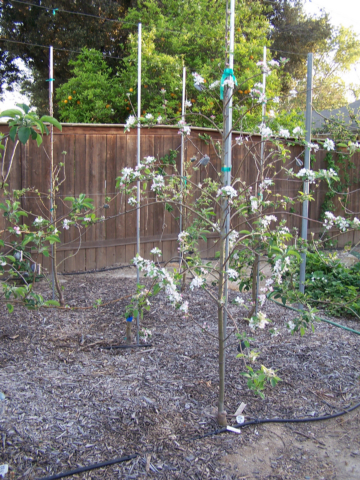 I believed that for a long time also, until I planted 100 varieties of apples and they fruited all over the place. People have said it must be because I live in a “microclimate” of lower chill that allows them to fruit. 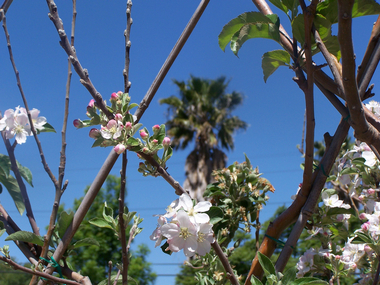 I then show them the above photo of a Terry Winter apple tree blossoming like crazy right next to a Valencia Orange tree, also blossoming like crazy. 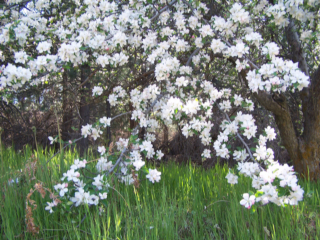 I get the beauty of the apple blossoms and the scent of the orange blossoms, thus the title of this blog, Apples and Oranges. By the way, I pulled out a big clump of banana trees to plant the apples in the photo. Yes, apples do behave differently here, and some are more suited to our climate than others. But what’s so different about that? Its true for every apple-growing climate; North Carolina growers can’t grow Northern Spy very well and Northeastern growers can’t grow a decent Fuji or Pink Lady. Folks in Washington State wish they could grow GoldRush and they all have late spring frosts that can wipe every blossom off a tree some years. I would venture my apple crops are some of the most reliable in the country, and I can grow one of the widest selections of apples. Yes, wonderful things happen that aren’t supposed to, and they happen all the time. My wife was reading the spring Gurney’s Catalog and she read the description of Pixie Crunch. It had a photo of Prof. Jules Janick, who developed the variety at Purdue University through the PRI (Purdue, Rutgers, University of Illinois) breeding program. It sounded good to her, and asked if I’d be interested in trying it. “OK” I said; “I’ll ask them to send me some scionwood”. My wife was confused, thinking I meant Gurneys. “No” I said, “Jules. Jules Janick, the guy in the photo there”. “You know him?” she said. I pulled up an email from him inviting me to try the favorite PRI varieties, including Pixie Crunch, in our climate in order to test them. She gave me an amazed look that let me know I had truly achieved “Apple Geek Status”. The scionwood arrived in a couple weeks and is now sprouting on rootstocks. We will know next year if they are worthy of our climate. And oh, by the way; if you’re reading this blog, you just might be an Apple Geek.